nine × 4 = Required Please enter the correct value. Over the past three months, the Bitcoin price chart doesn't look much like the charts for other investments, many of which – especially commodities – are way down. Since Sept. 15, the Bitcoin price is up a stunning 93.5%, rising from $230 to about $445 today (Monday), according to the CoinDesk Bitcoin Price Index. This sharp rise in the price of Bitcoin suggests the digital currency has recovered from the 2013 bubble and is poised for bigger gains in 2016. 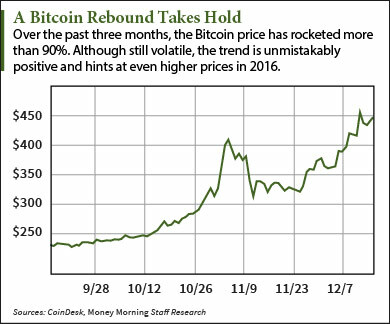 Since hitting a 2015 low of $173.06 on Jan. 14, the Bitcoin price spent much of the year stabilizing between $200 and $300. The Bitcoin price chart saw its first significant spike in more than a year in August, when it briefly broke past $300. The current run started at the end of September – primarily driven by rising demand in China. The initial spike in the Bitcoin price occurred in early November. Volume on the Chinese exchange BTC China tripled in less than a month. The website ZeroHedge theorized the surge in Bitcoin demand from China was the result of the tightening of capital controls on the yuan. The Bitcoin price jumped over $400 then fell back to about $350. But over the past three weeks, a second surge took the price of Bitcoin as high as $468. Again, demand in China skyrocketed, with volume on the Chinese Bitcoin exchanges zooming past the highs reached a month earlier. In my opinion this is very early pre speculation based on next years block reward haslving.